5793 labyrinths found. Showing 5741-5760. Sorted by country, state, city, then zip/postal code. 4 miles outside downtown Wisconsin Dells. 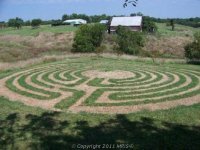 Labyrinth created at La Paix Herb Farm in 1998 by Mountain State Dowsers - in continuous use and maintenance since. Always open, next to the street with no gate. The 'Vision Quest' Memorial Prayer Labyrinth located in the Centrum (sanctuary) of Christ Church United Methodist, Charleston, WV. The Church is located on Quarrier Street between downtown Charleston and the State Capitol in what is known as the East End of Charleston. 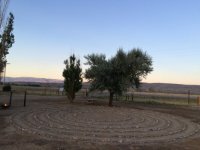 The labyrinth will normally be available from 8:00am to 5:00pm. The design is called "Vision Quest." It consists of 8 rings laid out in an octagon pattern. 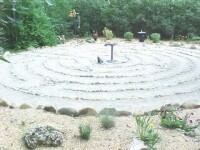 Labyrinth is located behind the Inpatient Facility. Please park in the Office building parking lot and take the path over. Daylight hours only. The rich natural history of the Greenbrier River Watershed is the inspiration for this unique community built labyrinth. The river is represented twice in the 1/10 mile walking path. The central path shows the whole beautiful ribbon of the entire river. 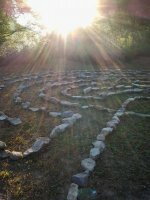 The labyrinth is located at the North Caldwell boat launch between Lewisburg and White Sulphur Springs, where the Greenbrier river crosses route 60 - to the south of the road and west of the river. 37 degrees 46'° Lat. ; 80 degrees 23'° Long. Off of route 460, Oakvale Exit. Turn right at stop sign in front of Fredeking Funeral Home, another right at Fire station onto Route 112 appoximately 2 miles, yellow house, third wooden bridge after crossing railtracks in Oakvale. 39, 16.482' N° Lat. ; 81, 33.245' W° Long. 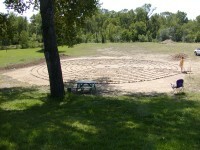 Aerial view of the labyrinth. 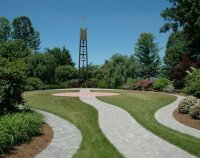 Chartres replica on a slight hill with mowed grass pathways and with tall grass dividers, 100 ft across, takes 15 min to get to the center. 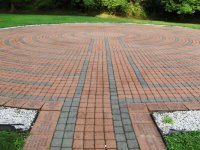 The labyrinth is situated on the back lawn of the church. Directly in between Basin and Greybull WY next to the hospital. The public is welcome on our property. Go to Chamber of Commerce for directions, if needed. Corner of Burritt & Lott St.
A 7 circuit design based on a labyrinth in Ravenna, Italy.